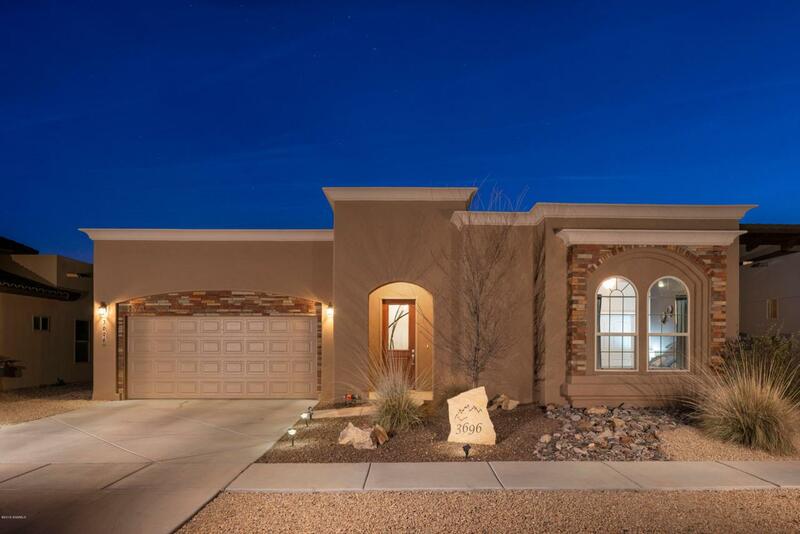 3696 Santa Cecilia is a wonderful and sparkling property in beautiful Metro Verde. Quality craftsmanship is reflected in the fine details and amenities. The foyer with custom entry medallion and decorative cove ceiling welcomes you home. The open concept floor plan and split bedroom design is ideal. Gather around the island in the fabulous kitchen as the chef gets busy 'cookin' on the nice gas stove. Cedar plank beams, a cozy fireplace and lighted nichos add warmth, comfort and style. A four panel sliding glass door creates a seamless transition to the outdoors. The extended covered patio is awesome and creates two separate areas. It's time for 'grillin and chillin' as you relax and enjoy the unobstructed Organ Mountain views. A buffer zone in back allows for extra space between neighbors. Complete professional landscaping is refreshing. Close proximity to employers, shopping, highways and entertainment. This spectacular home is light, bright and move in ready.